Non fiction has crept into my reading habits, seemingly of its own volition. It's partly come from maturing interests - wanting to know more about the social issues I believe in than what comes from media and conversation. Although it's the medium I mostly write in, I don't always enjoy reading it, and often find it frustrating. The genres of non fiction are just as diverse as those of fiction, and I don't mean only the breakdown between biography, sport, science etc. Tastes and styles bring as much to bear on the reader experience. I tried reading The Brain that Changes Itself, because it came up so repeatedly in conversation. I couldn't gel with the book's style at all. It seemed to oversimplify, to talk down to its audience, and while that may have been a conscious decision to expand its market, I don't come to the topic of neuroplasticity expecting to be patronised rather than challenged. I started The Accidental Billionaires, but as recorded it was more about sensationalism than story, and I was after accurate history rather than cobbled conjecture. 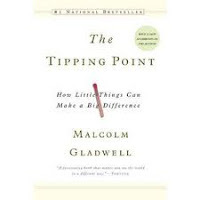 I came to Malcolm Gladwell via many recommendations, and his subject matter held a lot of promise. The Tipping Point examines social epidemics and how behavioural trends - whether in retail, business or a neighbourhood - go viral. For a lot of the book I was conscious of that familiar non-fiction malady, wherein the author seems to contradict themselves or not take into account a glaringly important element in the point they're trying to prove. Gladwell always managed to come back by the end of the chapter, however, and correct or explain himself. Even while Gladwell was frustrating me and I was feeling dubious about his thoroughness, I found I kept bringing him up in conversation. This is part of what has made him such a successful author - he takes parts of society that we perhaps had never thought to analyse, but which are nevertheless familiar and recognisable, and constructs believable, relatable pscyho-social theory around them. The world really is full of Connectors (someone about whom you'd say 'They know everyone'), Mavens (the people you turn to when you need information or a good recommendation) and Salesmen, the three personality types critical for spreading a social epidemic. Some of the studies he cites are fascinating - like the Gore company (manufacturers of Gore-Tex) who have discovered that business camaraderie and effectiveness drastically reduces with working groups of more than 150 people. Sometimes, though, I couldn't help thinking, as apt and interesting as many of his examples were, one or two studies in the history of social behaviour does not a law make. I guess, though, if I wanted proof, I'd be reading his journal articles and academic papers, not a book for the mainstream. It seems that sometimes in non fiction the author asks you to suspend your beliefs for a little while - just as sometimes in fiction you need to go along with some poetic licence to get the plot and/or character where they need to be. Perhaps, once I learn to read for fiction techniques in non fiction, rather than just using them in my writing, I'll find it less frustrating.